The London crayfish party was a success and so much fun! There was only ten of us but we managed to demolish 5 kgs crayfish and drink two bottles of snaps (as well as beer and wine) and sing snaps songs. Thank you to everyone involved for embracing my country’s silly traditions and being such fun guests! Before we started on the crayfish though, we had some prosecco and nibbles. I usually start a dinner party with nibbles as I think it’s such a nice informal way to start the evening and get people chatting. 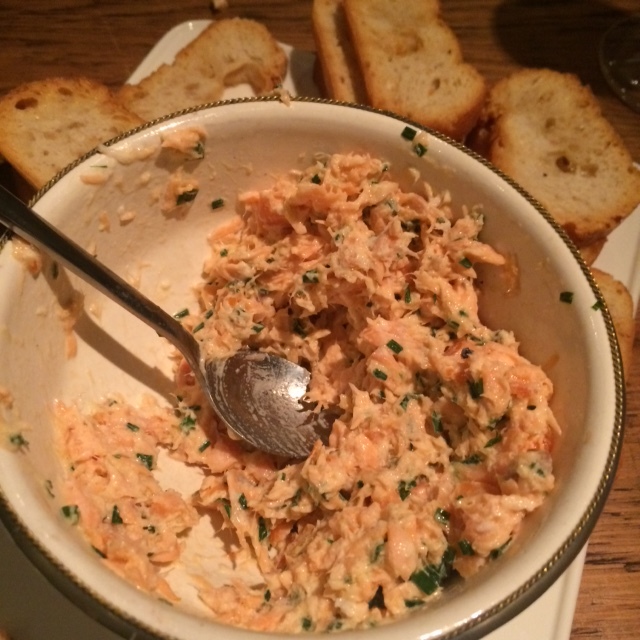 One of the nibbles I made was this hot smoked salmon spread. I just put it in a bowl and the guests assembled their own crostinis. Adapted after and translated from Arla’s recipe. Check the salmon for bones and remove them and any skin. Place in a bowl and mush it with a fork. Add soured cream, horseradish (Ocado has the fresh stuff) and lemon juice. Add the lemon juice and season to taste. Keep refrigerated until serving. I cooked us four courses on New Year’s Eve so we could enjoy a long and nice dinner. It was all traditional Swedish with snaps and snaps songs, and we also had a few interludes to cheer Happy New Year in places further east than us, so more or less the whole of Russia were celebrating midnight at one point during our supper. This first starter, a lovely prawn mousse, was great to start off with, as it can all be prepared ahead, kept cold and decorated a bit ahead of time as well. The texture is not as mousse-y as a chocolate mousse, the cream is there more to combine the other ingredients and bring them together. I served this with some homemade Toast Melba, just to add some crunch, and it worked really well. But bread or perhaps a side salad with avocado would work well too. The recipe is courtesy of fellow Swedish blogger Annika. I followed it promptly but changed the method slightly as I used vege gel instead of gelatin and that requires a different approach. I also doubled it, and that was enough for nine, and even ten, people. Peel the prawns. Set aside 5-6 per portion or the prettiest prawns. Chop the rest and add to a bowl. In a saucepan, mix creme fraiche, cream and the vege gel powder. Turn on the heat and bring to the boil while stirring. Cook for about 5 minutes as it thickens. Leave to cool for a few minutes. Chop the herbs and add to the chopped prawns. Also add the horseradish, caviar and lemon juice. Mix it together. Add in the cream mixture and mix well. Season. Pour the mixture into 4 glasses or serving bowls. Place in fridge for at least two hours to set and cool. Decorate with the prawns, dill, chives and horseradish. (I added a lemon slice as well).